Mountain Dew and Food Lion have teamed up and they're giving away a 2016 Jeep Renegade worth more than $20,000! 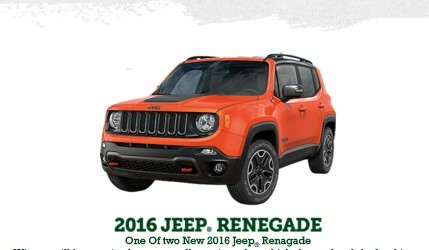 Two (2) Grand Prizes will be awarded, each Grand Prize consists of one (1) new 2016 Jeep Renegade Prize (each a “Vehicle”), as determined and chosen by Sponsor. Manufacturer’s Suggested Retail Price of each Vehicle Prize: $20,990. DELAWARE, GEORGIA, KENTUCKY, MARYLAND, NORTH CAROLINA, PENNSYLVANIA, SOUTH CAROLINA, TENNESSEE, VIRGINIA, OR WEST VIRGINIA residents ONLY.